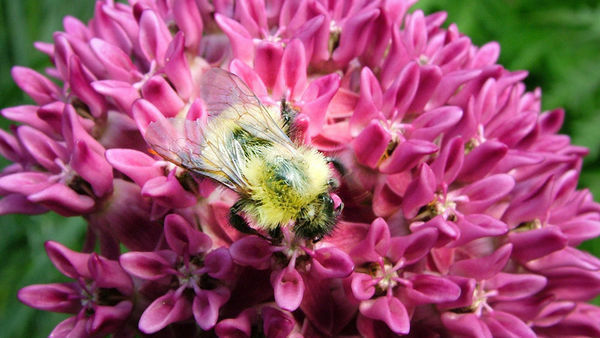 Today’s photos are of Gail Cortese’s new garden. 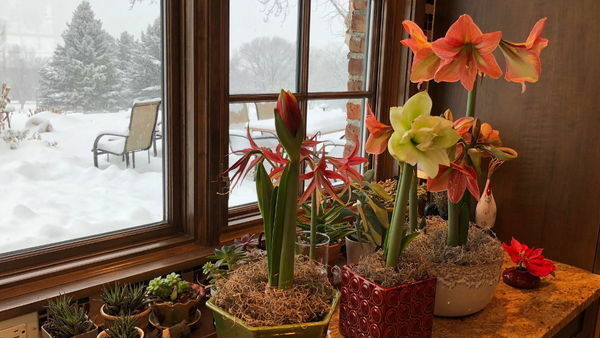 Having to downsize from a large, beloved garden is difficult, but these pictures make it clear that you can go from a large space to a small one without sacrificing having a wonderful, flower-filled space! We lived on five country acres on the north Olympic Peninsula of Washington state for almost 25 years. Age and health demanded we sell out and relocate to a smaller place. However, I told my husband that I wouldn’t go if I couldn’t take my house and gardens with me! We located a new development on a hillside 35 miles east where there wasn’t so much rainfall, in the little town of Sequim. We found a nice corner lot that had space for a nice little version of my previous English garden, and the builder agreed that I could design my home to fit. I divided my beloved perennials, located nurseries where I could find the roses I had left behind (since I couldn’t dig up my roses), and thus began the move! We have been here now for three years. The gardens are flourishing so well that our local garden club came to visit and loved it! Here are a few photos of our lovely little garden. What was Brierwood Farm became Brierwood Cottage. The new cottage. It doesn’t sit on a large farm, but there is a lot of beauty in this little lot. 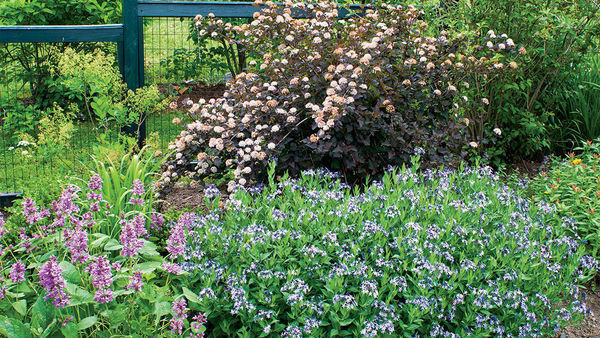 The style is classic English cottage garden, full of soft, romantic perennials and roses. Blossoms glowing in the sunshine. Could anything be more romantic than an informal gravel path surrounded by abundant flowers? Bright California poppies (Eschscholzia californica, annual) bloom like sunshine you can touch. It is hard to believe that this garden is only three years old; it already looks so full and mature. I hope Gail will send us an update in a few years to see how it continues to evolve! 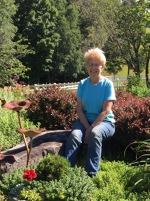 Congratulations, Gail on this wonderful garden! I bet it is quite inspiring to your new neighbors. It is also an inspiration to those who may fear downsizing given your 3 year accomplishments. Using the large scale gravel as a path through this cottage garden seems to simplify the worry about edging materials. I hope the configuration of the gravel during winter creates pleasing lines to soften the picket fencing. Brava! Actually we hadn’t planned cobble pathways but it was raining so much when we laid out the plans we found 2” cobble was the best. You can’t see it but I used cantaloupe sized blasted basalt as bed edgings because the beds are about six inches tall. Didn’t want mulch spilling out onto the gravel. The final grading by the builder of the area for the little yard left us with an almost 20” deep area 6’ around for drainage! So in order to give the end of the yard a flat surface, we filled it with several yards of that cobble. Didn’t affect drainage and gave us a flat yard! Installed a little pond recessed level in the cobblestones. That was how we arrived at the choice of 2” cobble for pathways and open area at the end. what a smart approach! 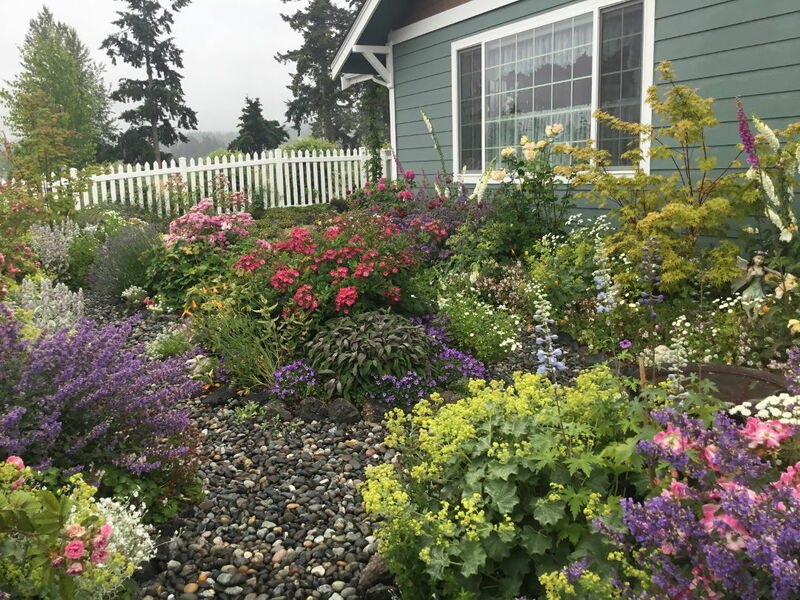 I'm redoing a back area (ripping out vole/ground squirrel tunneled lawn) and replacing it with gravel; I was trying to figure out how to manage the edging (it has a slight downward slope)- I am definitely going to 'steal' this approach...and will give you all the credit! 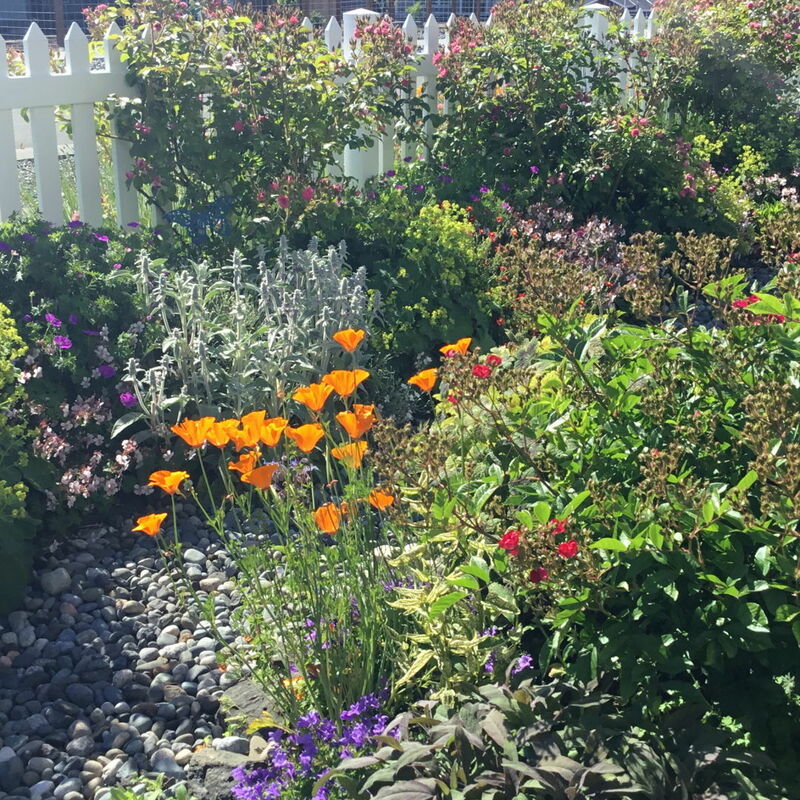 Check out my FB page, Gail Horton Cortese...I have photos of beginnings of the garden and what solution I came up with for an angled retaining slope! We ended up with slopes all around that side and along the back of the house which is only 14’ wide from house to fence! Builder had to do grading according to code so we couldn’t do the level pavers originally planned. Hence we just filled in all the sloped areas with cobble giving it all a nice level look! By leveling all the surfaces it makes the yard appear wider. Also, 2” cobble won’t disappear into the dirt like small crushed rock does. Wow, just amazing what you have accomplished in 3 years. 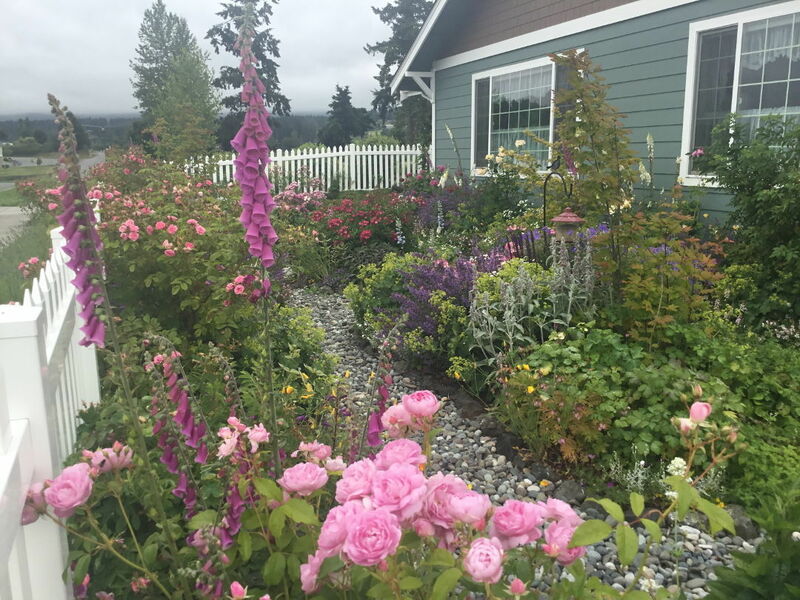 The wonderful Mediterranean climate of Sequim is highly advantageous to maximum growth of perennials and Roses. The first year I used little plant markers to show where I had planted stuff, everything was so little! As they say about perennials, first year they sleep, second year they creep, third year they leap! Your new garden is not only beautiful but also inspiring and encouraging. Many of us are in the window where we know our time with our large properties is drawing to a close. The physical design of your home is charming (kudos to you on that as well) and your landscaping frames it perfectly. Thanks so much for sharing your story and photos. You certainly have created a lovely combination of cottage and cottage garden. 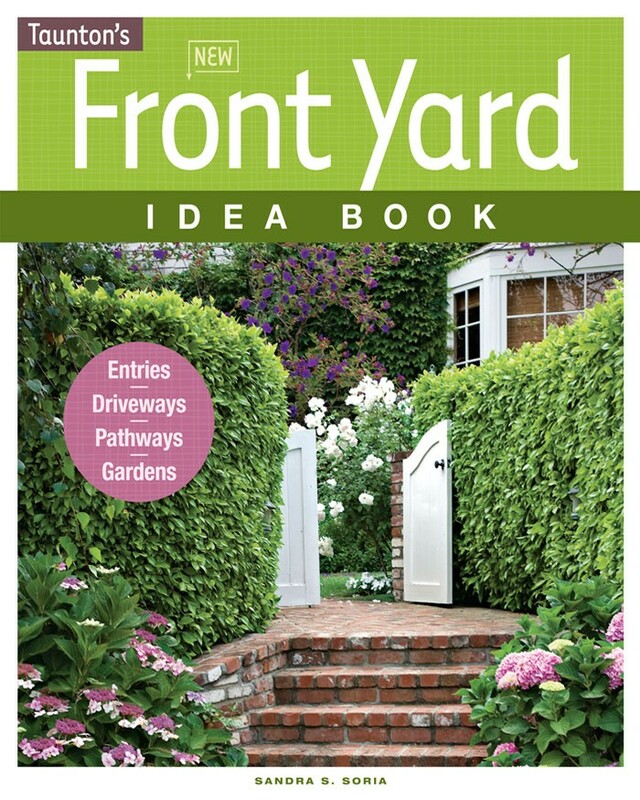 I looked at it and thought, "Oh boy, I really need to dig up my front garden beds and do something with the soil." That lady's mantle is impressive! What is the hedge on the sidewalk side of your fence? Lavender? 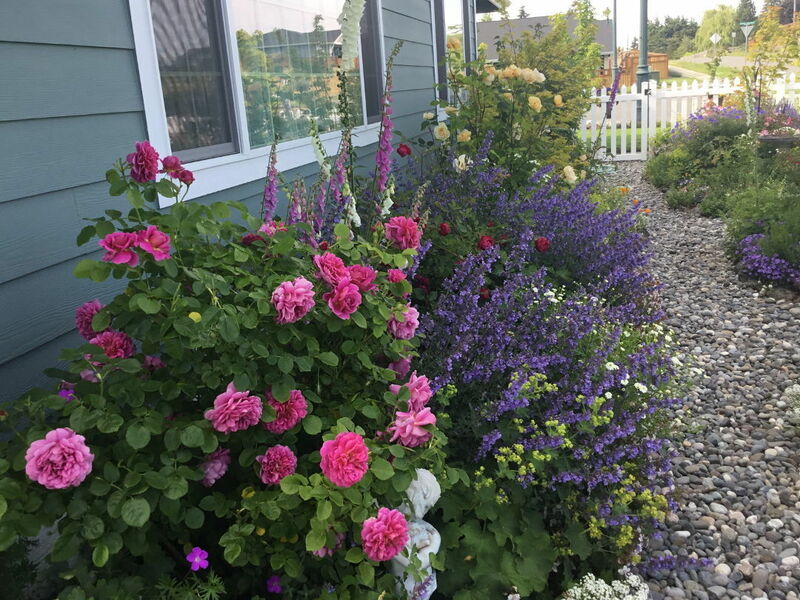 The plants along the outside of the picket fence are Phenomenal lavender, bloom July- oct. pink roses on picket fence are Grootendorst rugosa pink. Deer don’t touch them. When they mature more they will literally smother the fence. My ladies mantle loves it here! Need to thin them by division this spring. We had to put a small retaining wall along the south side so chose blasted basalt small boulders size of watermelons, cantaloupe, filled with leftover building dirt and planted it all with sedums and creeping thymes. The low growing pink plants you see along curve street front are sedums planted in pockets of dirt in cantaloupe size basalt edging rocks. Gail, congratulations on your positive attitude and organized approach to downsizing and to problem solving. If we are lucky, we will live long enough to have to consider downsizing, and you have shown us an attractive solution to what is often seen as a sad and regretful process. Thank you! 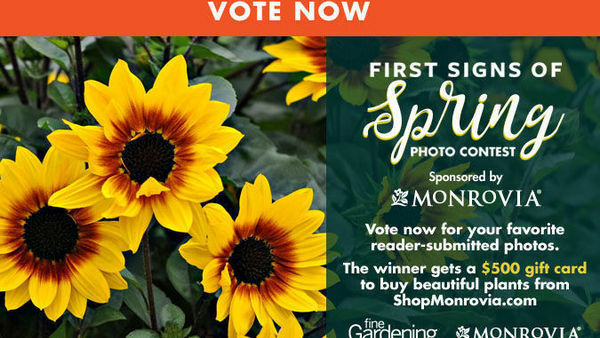 And do send in more shots, perhaps of your fall garden? Thank you. Yes, often downsizing especially for a gardener is a sad regretful experience. I was having none of that!😊 I spent weeks dividing and potting plants I loved to bring with us. I have a fenced side yard, between us and only one neighbor, that is only 6’ wide but 65’ long. We designed a little recessed back porch 4’ deep x 14’ long off the laundry room that opens to that area so I have a working area to stash plants until they get planted. Keep my bags of planting mix, compost, etc there with potting bench. Gated at both ends keeps my working area closed off so when I first moved all the plants, soon as the house was done and fence up, the entire area was filled full of gallon plants! 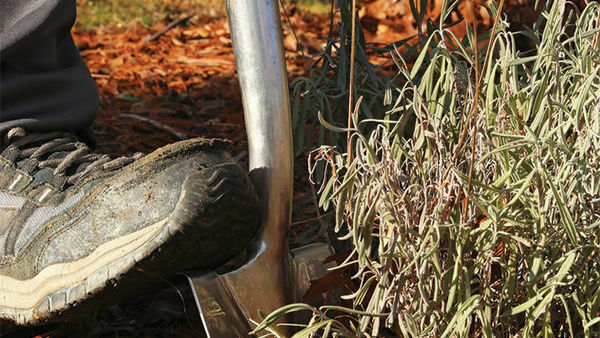 I kept so busy rebuilding gardens I didn’t really grieve our former country home. Now three years later I can see it was the best decision we could have made to downsize. I no longer have that second garage, garden barn, hundreds and hundreds feet of fence line to maintain and the myriad projects necessary to keep that large a property up. Puttering in my tiny English garden is such a pleasure. And when done, there aren’t other chores like before. When you are in your forties or fifties that much hard work is easy, not so much in your mid seventies! 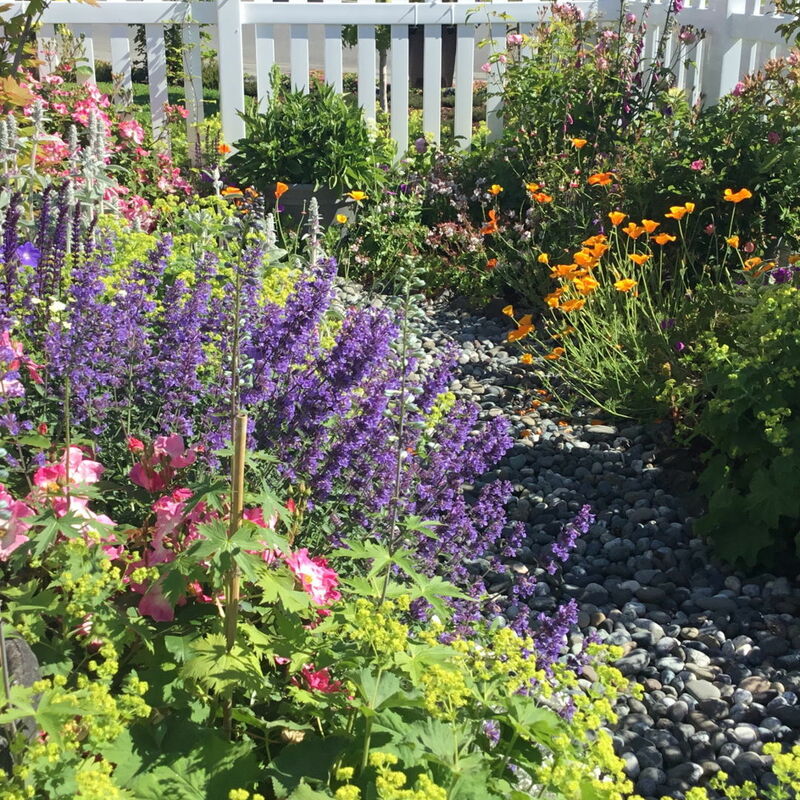 Your garden is astonishingly beautiful and very inspiring - thanks for sharing both the photos and your gardening tips about the edging and cobble paths. Thank you so much for your encouraging words! Originally had planned a grass center with just beds along the edges inside the fence but we finished building in November and builder requires landscaping be done in three months. And it rained and rained and rained! The entire side garden had three inches of standing water. So no lawn, raised beds and cobblestone walkways! And not shown in the photos, the 65’ fence along the far side that required a short retaining wall! Originally thought the entire yard both side and back side would be level..After final grading we saw the need to become very creative! 😳 So used rock placed on a 45 degree angle, filled the spaces with left over dirt, we had a lot, and planted creeping thyme with different sedums. When given lemons we made lots of lemonade and the result is awesome! What a lovely garden you have created. Do you cut the flowers for use inside? Brava! What a delight for you and the butterflies. gail, what a treat, in so many ways. i love it that you have faced major challenges (I'll say! like-- having to rethink your design plans that had been developed over a long period) while keeping an attractive pantry of choices. Conifer Heaven, and incorporating conifers into your gardens- will tie your gardens to their larger world beyond the fence. And grasses and conifers are important foundation plants that help the built environment to visually merge with its natural surroundings. for both plants; the sum being greater than each of its parts. Also consider more same-plant swaths instead of individual specimens. These limited photos don’t do the entire garden true justice. 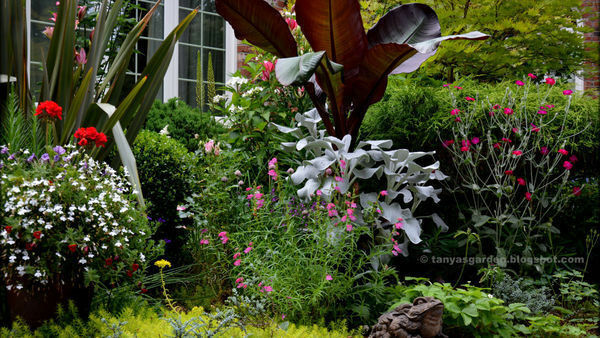 What you don’t see are the vertical pillars of jackmani clematis on porch corners, a wall covered with Montana Rubens, six feet high by 14’ long, the variegated foliage that is hidden in the photos chosen, the 65’ long angled succulent garden of pinks, purples and whites with splashes if blue lobelia. There are many textures from fuzzy to shiny smooth and inbetween. Around the corner out of sight are English Roses Boscobel, Lady of Shallot, Munstead Wood, Darcy Bussell, with catmint and ladies mantle as companions. There are quite a few hardy geranium specimens throughout which contribute variegated interestingly textured foliage and burgundy or whit or red or pink flowers. 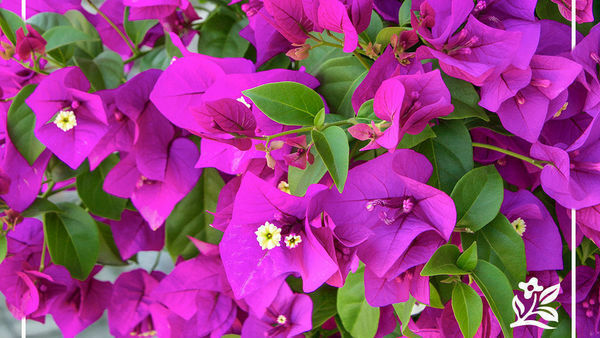 So many different plants bloom at their own time. That’s what makes this so beautiful, something is always in bloom. 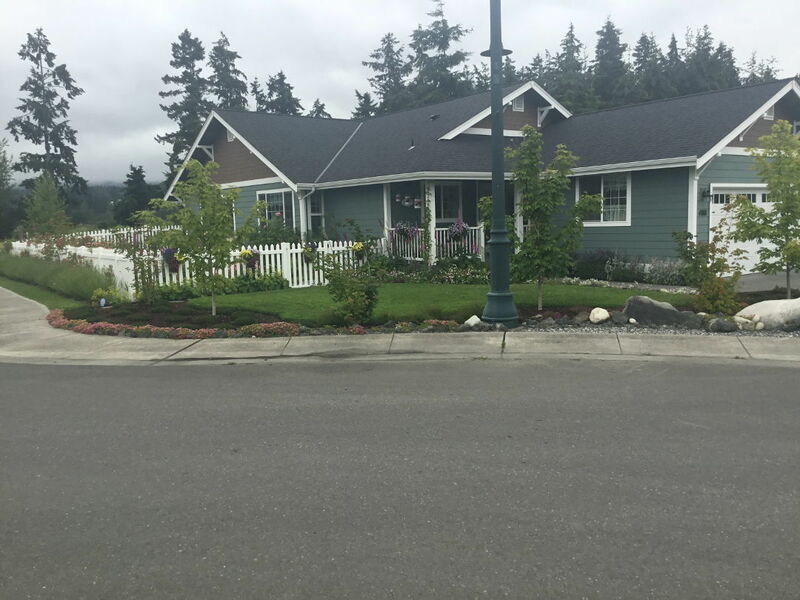 I simply do not have room for more than a couple ornamental grasses and conifers aren’t needed since we have conifers directly behind the house. 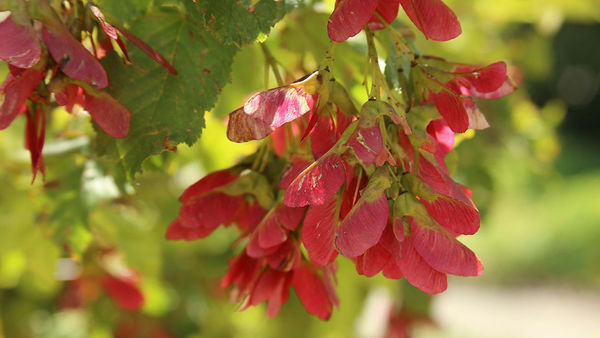 The trees not readily seen are Japanese maples and PNW vine maples. These guys are still babies. I placed them in locations that gives the needed permanent anchor verticals along with tall roses and a lilac. Remember, we didn’t go out and buy full size vertical plants. We brought baby plants with us. This is such a tiny space only 20 x 54 , evergreens would be a tad overwhelming. The perennials I have are favorites, the many varieties of ferns are favorites. 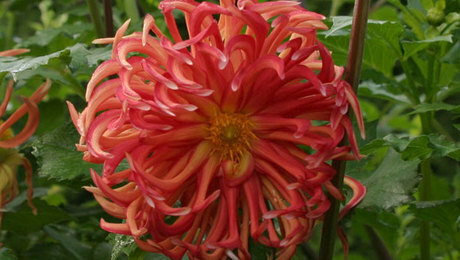 You don’t see the honey suckle with its variegated foliage and yellow flowers nor the several varieties of helianthamum with varying deep reds to light pinks. While I appreciate your critique, remember these few photos don’t tell or show the variety of plants. The front yard is clover lawn with purple heather around it. Three dwarf sugar maples with two native vine maples fit around the curve of sidewalk. I love soft colors so have a lot of pinks, blues, yellows with a softening of low growing hardy geranium of white tinged with pink. Splashes here and there of reds and burgundy add a pop of color and as shown in a couple photos, California poppies have volunteered to add their sunny spirit. My garden is filled with bulbs all spring and fall blooming perennials all fall into winter. Another few years and the garden will look better because the trees will have grown to add to the bones of the garden. 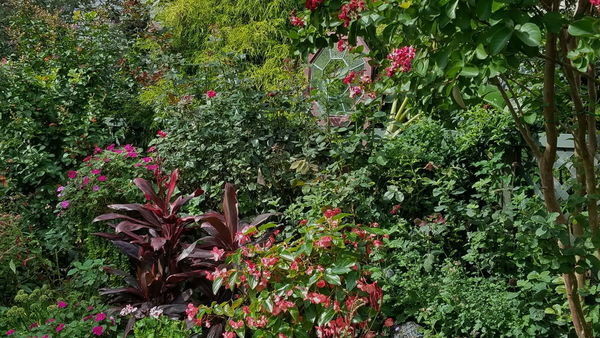 I want to add that my point in sharing my garden is that if you have to downsize, you can still have a lovely pretty flower garden of favorite plants. We went from five acres of gardens and wooded areas we planted from scratch to a tiny city lot bare of anything. 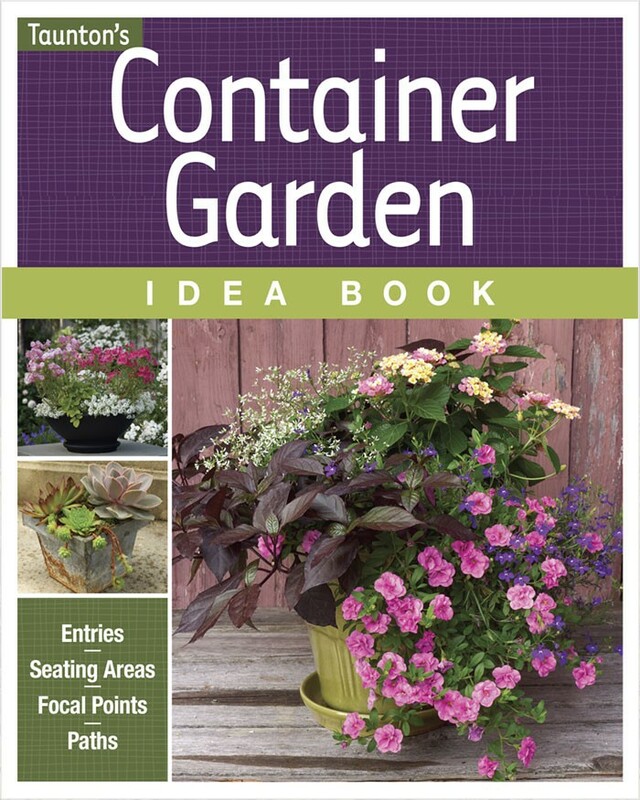 You don’t have to be a master gardener to know what you want and how to achieve that particular look. I am in my mid seventies with fake knees and Multiple Sclerosis. Downsizing after so many years of hard work has rewarded me with this tiny little garden of sheer pleasure. It may seem lacking to some but to me it is my passion. Thank you all for your lovely comments. I really enjoyed your detailed verbal "tour" of the parts of your garden that weren't visible in the photos. 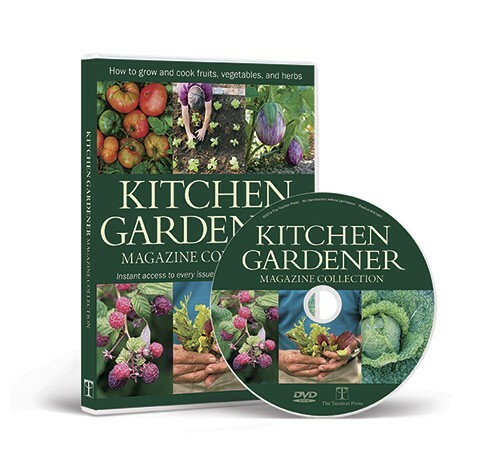 You have a an impressive breadth of plant knowledge and, evidently, an incredibly strong will to continue gardening inspite of your health challenges. You are even more inspiring than I originally assumed. Hi Gail! 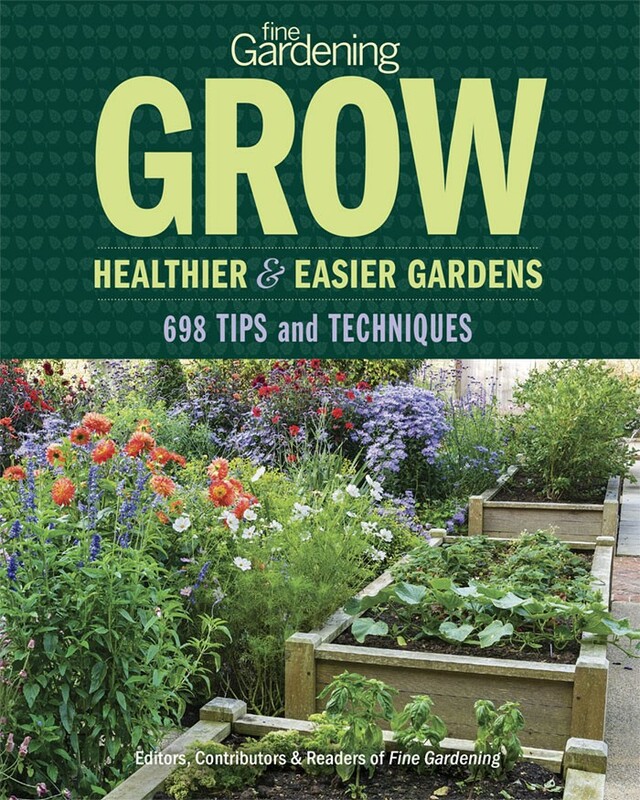 Thanks so much for the delightful and informative share of your new-ish garden and home. I love how we can once again have a dialog with the GPOD-er. I really missed the question and answer aspect, and am glad it is back. It illustrates how each of us gets to the garden of our heart, and can inform others of clever ways of dealing with challenges and differences of taste. I live near foothills outside of Seattle, and so many issues you have addressed so beautifully are relative to our space. 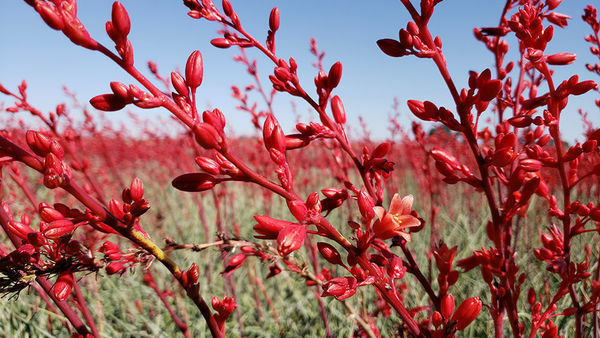 Can't wait to search out Grootendorst roses (wonder if Elk will also ignore them), and the great lavender you grow. Also, love your cobbles, and everything else, and can't wait to visit your fb page. Thanks for the inspiration! !Also, I just turned 71, and impressed with all you have done, fake knees and all. You go, girl! The week we moved in the entire Sequim elk herd bedded down directly across the road for three days! No neither deer nor elk eat Grootendorst roses. They browse the Wild Roses I planted all along the south fence ion the outside tho. Look for F J Grootendorst...they are old rugosas that come in red or pink and are indestructible. Another incredible rose if you have room is Darrow’s Enigma. Gigantic shrub rose entirely covered with single five petaled flowers all summer and they smell wonderful. I had two on each side of our country drive....10’ tall x 12’ wide! Its clear from this comments stream that Gail is a wonderful "can do" problem solver. Supremely good lemonade she has crafted from the grading lemons required by codes and the solution accommodates drainage, while storing contours that suit her. I, for one, would be embarrassed to toss planting suggestions her way since this is a deliberate garden that works!! plant/design Suggestions Unwelcome?? on FGPOD? so it's just a "Congratulations; how lovely" world? i have only admiration for your goals and successes and your lessons offered. i am 68 and have gardened and designed gardens for 40 years. after 3 yrs absence from garden activity, due to surgeries etc etc,i am just now rediscovering my passion for all things plant. 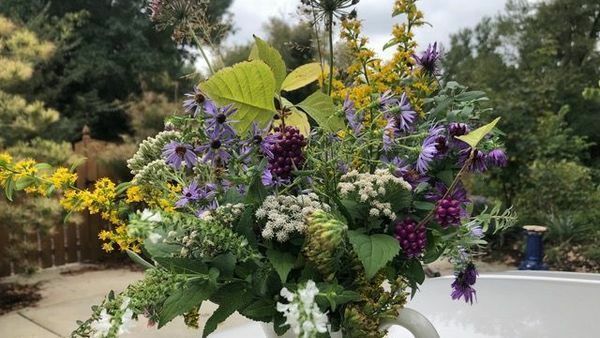 my gardening life has always been about learning learning and learning, and making my gardens succeed better with the visuals and experiences they offer. 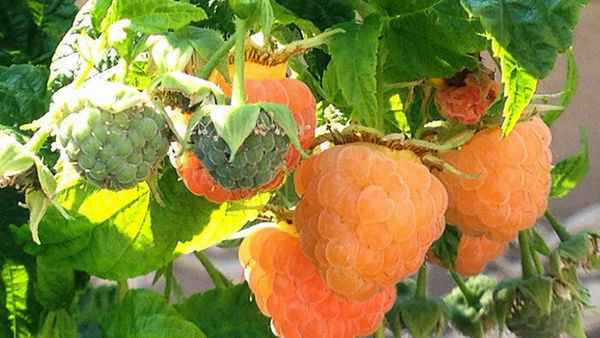 i guess you have made me realize that i have been travelling in a very small gardening world, where complete strangers/ host gardeners have always been eager to hear others' experiences and suggestions. i never meant my comments as CRITicisms; with all your talents, THAT would be very stupid on my part. congrats again on all your dramatic success.